Citation: Goree J, Rumpel D, Judkins D, et al. New protocol for treatment of complex regional pain syndrome: a case series. Anesthesiol Case Rep. 2018;1(1):13-15. Complex regional pain syndrome is a rare condition that causesdebilitating pain and loss of mobility to one or more extremities. While multiple tools have been developed to diagnose this disease, the treatments currently employed are highly variable and the results are unpredictable. In order to address this, we did a review of the literature and created a standardized six week complex regional pain syndrome treatment protocol which included many treatments with proven benefit employed simultaneously. In this article, we present our brief literature review, our standardized protocol, and three case reports of patients who had successful treatment of their disease with our newly established protocol. We also present a discussion detailing why we feel that this protocol has provided benefits in these first three cases. Complex regional pain syndrome (CRPS) is a rare but debilitating disease with an incidence of approximately 26 cases per 100,000 person years in a population study from the Netherlands . Although the underlying pathophysiology remains incompletely understood, the hallmark of the disease is regional pain with multisystem involvement presenting with symptoms of swelling, vasomotor changes, loss of mobility, and trophic changes. While the International Association for the Study of Pain developed the Budapest Criteria in 2003 to further standardize the diagnosis of CRPS, there has been little standardization of treatment of this disease . Physical and occupational therapy (PT/OT) have been shown to provide benefit, but prolonged patient participation can be challenging due to severity of symptoms and lack of motivation . While some medications and procedural interventions have shown promise, literature and randomized trials supporting these measures have remained sparse . To facilitate active participation in occupational therapy (OT), we have created a standardized protocol for the treatment of upper extremity CRPS which includes many treatment modalities with literature proven benefit. In this publication, we will review the literature discussing the individual pieces of our protocol. We will discuss the implementation and the four tenets of our protocol. We will present a case series of the first three cases in which this protocol was implemented. Lastly, we will end with a discussion of why we feel that this approach to the treatment of this disease has been a benefit to our patients at our institution. There is a large amount of variation in the current treatment of CRPS. Many physicians use a number of familiar medications that have been proven to have some benefit in the treatment of neuro-inflammatory pain. Unfortunately, many of these medications have either not been studied in CRPS patients or have shown poor or partial efficacy. Here, we will review a number of commonly used medications and interventions that have shown evidence of benefit in literature. Gabapentin: The largest study of gabapentin for patients with CRPS was done by van de Vusse in 2004. This study randomized 58 patients to either placebo or gabapentin 600mg TID. While gabapentin did not show a significant benefit in pain scores, it significantly improved Mann-Whitney monofilament application scores in the lower extremity. This is often used as a surrogate for allodynia and hyperalgesia . While this alone may not cause a clinically significant change in a patient’s outcome, gabapentin as a part of a multimodal approach has the potential to allow for a patient to better tolerate other modalities of treatment including PT/OT. Bisphosphonates: In multiple studies, bisphosphonates, both intravenous and oral, have demonstrated a statistically significant improvement in the visual analogue pain scale . In a study by Varenna, 82 patients were randomized to four treatments over 10 days of either an IV infusion of neridronate or placebo. While there was a statistically significant improvement in VAS at 20 days, this improvement gap continued to widen at day 40 . In as second study by Manicourt, 40 patients were randomized to 40 mg daily of alendronate for 8 weeks. In contrast to the placebo treated patients, all bisphosphonate treated patients showed improvement to spontaneous pain, pressure tolerance, and joint mobility . Ketamine: Intravenous ketamine has shown a significant reduction in pain scores and improvement of function but there are challenges in its continued administration [8,9]. One is that Kim et al. published a study which demonstrates a decrease in executive function in patients with long term ketamine use . Another is that the cost of administration prevents its universal use. While topical ketamine has not shown similar reduction in pain scores, the literature has illuminated some improvement in allodynia and hyperalgesia. In a study by Finch in 2009, 20 patients were randomized to either 10% topical Ketamine or placebo. The Ketamine population was found to have a significant improvement in limb allodynia. This could also be used to further facilitate participation in therapy and desensitization . Stellate Ganglion Blocks: Stellate ganglion blocks (SGB) are the most commonly performed interventional procedure for patients with upper extremity CRPS. The stellate ganglion is located anterior to the 7th cervical transverse process on the anterior surface of the longus coli muscle. It lies medial to the vertebral artery and anterolateral to the ipsilateral common carotid artery. This ganglion can be accessed either through fluoroscopy, CT, or ultrasound guidance. In a study published in 2006 by Ackerman and Zhang, 25 subjects underwent SGB at weekly intervals for 3 weeks. At 6 months, 40% of patients had complete symptom relief while 24% of patients had no pain relief [12,13]. In a second study, published in 2009, three weekly blockades were completed at weekly intervals in 22 patients with CRPS type I of the hand. Pain intensity and range of motion were assessed two weeks after treatment. In this study patients had statistically significant improvement in wrist ROM (P>0.001) and an overall decrease in VAS values from 8 to 1. While most physicians do not believe that SGB alone are effective in curing the disease, we do know that stellate ganglion blocks at least offer temporary benefits that last well beyond the effects of local anesthetic . This demonstrates that they may be a great tool to manage symptoms during continued PT/OT. Neuromodulation: For many years, Spinal cord stimulation has been used as a salvage treatment for intractable CRPS even though many studies have not proven long term benefit. In multiple studies published by a European neurosurgical group, there has been great benefit from this technology in the first year but the vast majority of patients experience a return of symptoms by year six . Newer dorsal root ganglion (DRG) stimulation technology may be more promising. In the most recent DRG stimulation trial, patients with CRPS have been shown to decrease pain by fifty percent or greater in 93% of patients with chronic intractable pain at three month follow-up, versus 72% of patients with a SCS implant . Unfortunately, this product is currently only FDA approved for treatment in the lower extremity. Smoking: Although the exact association between smoking and chronic pain is unclear, cigarette smoke contains hundreds of toxic chemicals and by products such as cadmium, nicotine, cyanide, and carbon monoxide. Long term use may result in decreased regional blood flow and localized tissue ischemia. Smoking can also decrease macrophage function, cause vascular endothelial dysfunction, and a systemic inflammatory response. Furthermore, chronic exposure to nicotine can decrease collagen and proteoglycan synthesis which many believe is necessary for CRPS improvement. Based on current literature, a protocol was developed at the University of Arkansas for Medical Sciences for the treatment of patients with upper extremity CRPS. The four tenets of the protocol are pharmacologic therapy, sympathetic blockade, physical and occupational therapy, and smoking cessation (Figure 1). 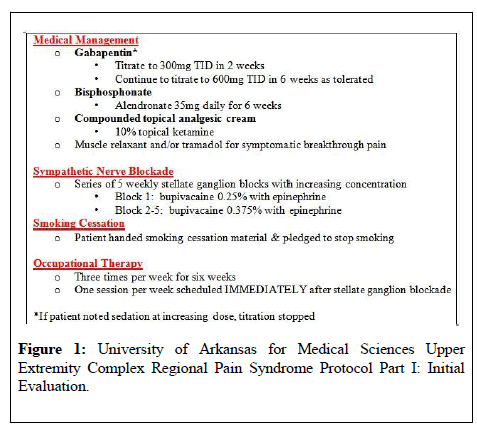 Figure 1: University of Arkansas for Medical Sciences Upper Extremity Complex Regional Pain Syndrome Protocol Part I: Initial Evaluation. For assistance with smoking cessation, patients are provided pamphlets and prescriptions for medications or patches. Pharmacologic therapy includes gabapentin with titration to 600mg TID, alendronate at 35 mg weekly, topical ketamine 10% applied TID to affected limb, and an optional muscle relaxant or tramadol if symptomatically warranted. Patients are immediately scheduled for stellate ganglion blockade to the affected extremity with 0.25% bupivacaine (1st block) and 0.375% bupivacaine (2nd-5th block) occurring weekly over five weeks, while concurrently participating in PT/OT three times per week for six weeks. One of the cornerstones of our protocol is that one OT session per week scheduled one hour after successful placement of the interventional block. Anecdotally, we find this to be one of the reasons for our high success rate. One month after completion of the protocol, patients are examined and placed in one of three categories. Those with continued improvement undergo continued home PT/OT with 6 months follow-up. Patients that improved during therapy but do not continue progression after the completion of the protocol repeat the initial protocol. Finally, patients who fail to improve with the first round of protocol or remain stagnant after their second round of the protocol are offered a dorsal column stimulator trial (Figure 2). 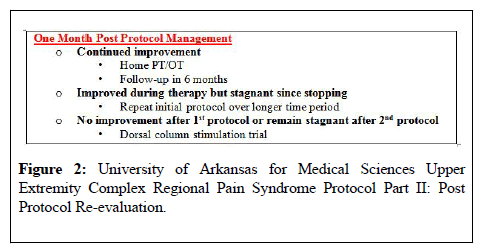 Figure 2: University of Arkansas for Medical Sciences Upper Extremity Complex Regional Pain Syndrome Protocol Part II: Post Protocol Re-evaluation. Three patients with unilateral CRPS type I of the upper extremity were initially enrolled in the protocol. Each patient was diagnosed during initial consultation using the Budapest clinical diagnostic criteria and gave consent to be involved in the protocol and subsequent case series. Patient 1 is a 44 year old male with past medical history (PMH) of smoking, anxiety, and a gunshot wound to the left hand and leg. He presented with left hand symptoms including 10/10 pain described as burning and shooting. He also described limb swelling, decreased temperature, and limited range of motion (ROM). On exam, he exhibited decreased ROM in his hand to 5° with severe allodynia, weakness, edema, and colour changes. On initial presentation, patient committed to stop smoking. He was then enrolled in the CRPS protocol which he completed after 50 days. At one month follow-up, post treatment pain decreased to 3/10 and his hand flexion increased to 40°. At six month follow-up, his pain had decreased to 1/10 with similar hand flexion. Patient 2 is a 60 year old female non-smoker with PMH of type 2 diabetes, morbid obesity, and hypothyroidism. She presented after left hand surgery with 6/10 pain out of proportion to her anticipated postsurgical pain, which she described as a constant burning and numbness. She also complained of a blue discoloration of her affected hand, swelling, and decreased ROM. On exam, she exhibited hyperalgesia, allodynia, decreased ROM and edema. After completing the protocol in 44 days, her pain score decreased to 2/10 with improved range of motion of all digits. At 6 months, her pain score had decreased to 1/10 with continued full range of motion of all digits. Patient 3 is a 33 year old female smoker with no other PMH who sustained a deep laceration injury to her right upper forearm while being robbed and assaulted. She sustained lacerations to multiple flexor tendons, the ulnar and median nerves, and ulnar artery requiring operative wound exploration, ulnar nerve repair, and median and sural nerve cable grafting. She initially presented to pain clinic approximately nine months after her injury experiencing right upper extremity 10/10 aching pain, decreased temperature to the affected limb, color change, and swelling. On exam she exhibited weakness, hyperalgesia, allodynia, and decreased sensation in her right arm and forearm. Patient committed to stop smoking at the initial visit. After 21 days of the protocol, her symptoms resolved completely and the treatments were stopped. At six month follow up, the patient continued to have full range of motion of her affected limb and 0/10 pain. This case series demonstrates that with aggressive treatment of upper extremity unilateral CRPS, significant improvements can be achieved in a short time frame. We postulate that the combination of early diagnosis, rapid initiation and titration of medications, repetitive sympathetic blockade, and aggressive PT/OT is paramount to improved outcomes. Although randomized trials for sympathetic nerve blockade are lacking, we believe that aggressive blockade allows for better pain tolerance, increased participation, and more rapid progression in PT/OT. We also believe that desensitization during stellate ganglion blockade local anesthetic duration improves patient progress during PT/OT sessions. We also believe that by protocolizing an “all in” approach, we are able to decrease loss to follow up and increase patient buy in to treatment. Further prospective randomized controlled trials remain necessary to evaluate and optimize this and any treatment for CRPS going forward. de Mos M, de Bruijn AG, Huygen FJ, et al. The incidence of complex regional pain syndrome: a population-based study. Pain. 2007;129(1-2):12-20. IASP, International closed consensus meeting for review of issues relating to CRPS (Budapest, Hungary; 2003). Bruehl S. Complex Regional Pain Syndrome. BMJ. 2015;351:h 2730.
van de Vusse AC, Stomp-van den Berg SG, Kessels AH, et al. Randomised controlled trial of gabapentin in complex regional pain syndrome type 1. BMC Neurol. 2004;4:13. Giusti A, Bianchi G. Treatment of complex regional pain syndrome type I with bisphosphonates. RMD Open. 2015;1: e000056. Varenna M, Adami S, Rossini M, et al. Treatment of complex regional pain syndrome type I with neridronate: A randomized, double-blind, placebo-controlled study. Rheumatology. 2013;52(3):534-42. Manicourt DH, Brasseur JP, Boutsen Y, et al. Role of alendronate in therapy for posttraumatic complex regional pain syndrome type I of the lower extremity. Arthritis Rheum. 2004;50(11):3690-7. Schwartzman RJ, Alexander GM, Grothusen JR, et al. Outpatient intravenous ketamine for the treatment of complex regional pain syndrome: A double blind placebo controlled study. Pain. 2009;147(1-3):107-15. Sigtermans MJ, van Hilten JJ, Bauer MC, et al. Ketamine produces effective and long-term pain relief in patients with complex regional pain syndrome type 1. Pain. 2009;145(3):304-11. Kim M, Cho S, Lee JH. The effect of long term ketamine treatment on cognitive function in complex regional pain syndrome. Pain Med. 2016;17(8):1447-51. Finch PM, Knudsen L, Drummond PD. Reduction of Allodynia in Patients with Complex regional Pain syndrome: A Double Blind Placebo Controlled Trial of Topical Ketamine. Pain. 2009;146(1-2):18-25. Ackerman WE, Zhang JM. Efficacy of stellate ganglion blockade for the management of type 1 complex regional pain syndrome. South Med J. 2006;99(10):1084-8. Yucel I, Demiraran Y, Ozturan K, et al. Complex regional pain syndrome type I: efficacy of stellate ganglion blockade. J Orthop Traumatol. 2009;10(4):179-83. Price DD, Long S, Wilsey B, et al. Analysis of peak magnitude and duration of analgesia produced by local anesthetics injected into sympathetic ganglia of complex regional pain syndrome patients. Clin J Pain.1998;14(3):216-26. Kemler M, de Vet HC, Barendse GA, et al. Effect of spinal cord stimulation for chronic complex regional pain syndrome type I: five-year final follow-up of patients in a randomized controlled trial. J Neurosurg. 2008;108(2):292-8. Levy R, Deer T, Grigsby E, et al. AProspective, Randomized, Multi-Center, Controlled Clinical Trial to Assess the Safety and Efficacy of the Spinal Modulation Axium™ Neurostimulator System in the Treatment of Chronic Pain. Presented at NANS 2015.